10 band multi band compressor, designed with the intuitive workflow of a graphic equalizer. The HQ-2 is built around 10 bands of RMS compression, which is useful for compressing the average level of a signal rather than the peak level. The result is a transparent compression that can bring quiet details up in the mix while achieving consistency in the tone of dynamic source material. This makes the HQ-2 ideally suited for instrument busses and the mixbus, where it can help glue your mix together. However, given the 10 bands of multi band compression and the graphic equalizer workflow, the HQ-2 is also perfect for a wide range of individual sources! RMS compression allows transients to pass through largely unaffected, while compressing the average signal level instead of the peak level. This is useful for evening the level of a dynamic source, such as a vocal or a bass guitar, while still retaining a sense of transparency. Since we’re not compressing the peak level, the transient shaping effects of traditional compressors are less apparent. The HQ-2 utilizes RMS multi band compression to provide a transparent compression effect that one can use as easily as a graphic equalizer. Simply boost or cut and listen to how it’s changing the sound of your sources. The HQ-2 features an always on gain compensation algorithm. This ensures the result is always at a constant perceived loudness. For those unfamiliar with automatic gain compensation on eq style plugins, you may find the results a bit unexpected at first. Raising the bass on a standard eq will result in the bass getting louder. In EQ’s with automatic gain compensation, raising the bass keeps the bass at a similar perceived loudness while lowering the rest of the signal. You still end up with the same sonic result, with the added benefit of automatically adjusting the output gain to counter the boosts and cuts you made. Bands The interface is built around the workflow of a 10 band graphic eq. Each of the 10 bands adjusts the threshold and the makeup gain simultaneously. When a band is set to its neutral position, the threshold of that band is set to 0 dbfs. When cutting a band, you lower the threshold of that band while also reducing the makeup gain of that band. This is helpful for compressing and reducing harsh frequencies. When boosting a band, you lower the threshold of that band while also increasing the makeup gain of that band. This is helpful for compressing and lifting details up into the audible ranges. REMEMBER: Boosts will raise the makeup gain while lowering the threshold. Cuts will lower the makeup gain while lowering the threshold. To the right of the 10 bands is the global compression control. This allows you to set the attack, release, and ratio for the RMS compressor. Ratio sets the amount of gain reduction. When set to zero, there will be no compression. This can be treated as a “strength” knob. 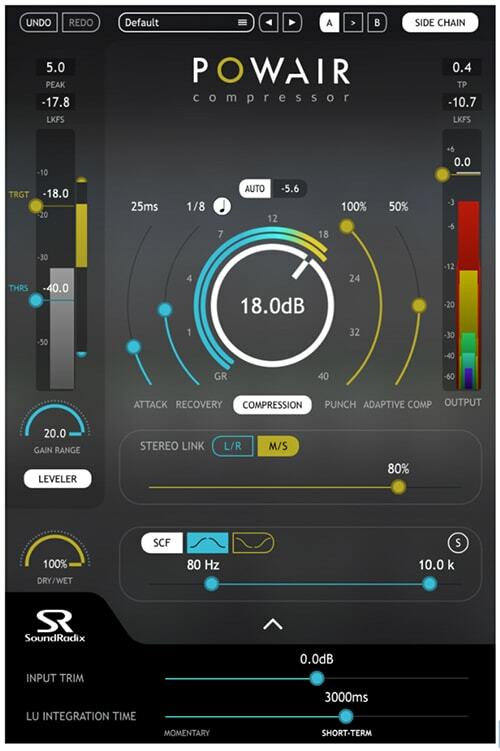 Dial in the eq balance you want using the 10 bands, then adjust the strength of the compression effect with the ratio control. Start at zero, and turn it up until you have the desired amount of compression. ​ - Use the HQ-2 on a bass guitar to even out the strength of the low end, adding consistency to bass lines that play at various octaves and preventing the low end from getting thin when higher notes are played. Use the HQ-2 on acoustic guitar to bring up the low level information in the sustain, helping thicken up the acoustic guitar in your mix, while shaping the spectral response to suit the needs of your mix. ​ - Use the HQ-2 on vocals to even out a dynamic vocalist, while adding consistency to the performance’s frequency response. Use the HQ-2 subtly on the Mix Bus to add a touch of glue while evening out the spectral response and reducing harshness in the upper mids. Use the HQ-2 on snare drum to lift the fundamental around 250 Hz, which will gently lift ghost notes up in your mix. A boost at 8K will also bring out the snap of your snare. ​ - Experiment. This is a very versatile tool, with varied uses. Please give us feedback on your favorite uses for the HQ-2!